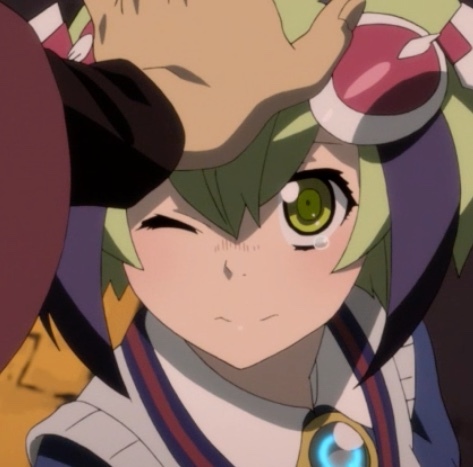 In Dimension W’s 10th episode, Resurrected Nightmare, Mira Yurizaki and Kyōma Mabuchi fight — but not with each other! Ruwai Aura Tibesti doubles down. The crazy scientist continues his work behind the scenes! A large, multi-tentacled robot attacks, and Yurizaki declares that she’ll defend Mabuchi. She teams up with the brother and sister team to disable it. However, when it sees Mabuchi unconscious in his car, it commits its reserves and rushes him. Though she’s able to remove its coil, the robot throws Yurizaki into the void, where she shuts down. Fortunately, Mabuchi awakens just in time and uses his wired weapons to bring her back. Mabuchi thanks Yurizaki for helping him. Let that sink in for a second. He thanked her! Capture from the Funimation stream. 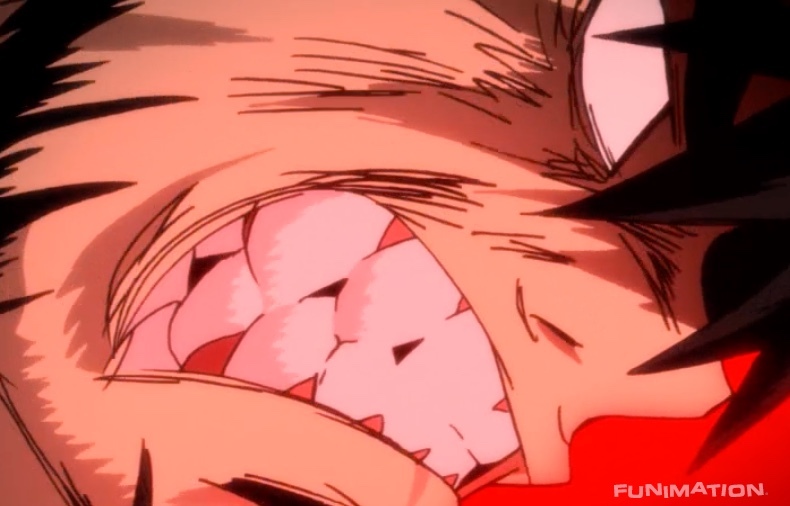 Mabuchi rips a coil-less device off of his earlobe. He suspects that it was the cause of his vivid memories while trapped within Haruka Seameyer’s dimensional energy sphere. The device had been warped into position, and Mabuchi begins to remember the device that would transport matter leveraging Dimension W. Adrastea’s goal was “space development.” The plan was to to transport an entire base, personnel and all, into space. Apparently, after shoving scientist after scientist through the portal and watching them turned to goo, Seameyer concluded that transporting organic beings was impossible. Mabuchi is convinced Seameyer didn’t die when Easter Island fell since the transporter gate is still open. They conclude that making Mabuchi remember is part of Seameyer’s plan. Ruwai, his robot body seriously injured, finds them. He tells Mabuchi to run. K.K. arrives, and we find out why he operated on Yuriy Antonov in a previous episode: to shove a coil into Yuriy’s brain so he’d become a mindless slave. Mabuchi and his team run to protect the injured Ruwai. In another location on the island, Jason Chrysler, secretly using numbered coil 001, attacks Loser. Jason knows that Loser’s trying to bring back Adrastea using the numbered coils. Furthermore, he knows Loser wants the uber coil, “the coil that surpasses all the Numbers.” Loser states that Dr. Shidou Yurizaki himself locked the uber key away because it was too dangerous. Seameyer seems to have found it or recreated it. The fight begins to go against Loser. Mabuchi and his team are cornered in an old facility. K.K. found some humans, devoid of souls, still in reasonable good shape, trapped in the void. He slapped coils on their skulls and programmed them to help him. In the ensuing battle, Mabuchi becomes separated from the rest of his team. K.K. summons a zombie-fied Doug, one of Mabuchi’s fellow Grendels who had infiltrated Adrastea, to attack Mabuchi. Mabuchi feels torn; he wants to restore Doug, but he also wants to stay alive. In the end, Doug dies after Mabuchi disables the coil sunk into his brain. K.K. wonders aloud if Mabuchi’s memories have been erased. Mabuchi himself wonders the same thing; did Seameyer somehow send Mabuchi through the transporter using the uber coil? Did that transport suppress Mabuchi’s memories? But no, Mabuchi recalls that Seameyer confessed transporting humans resulted in their deaths. Then Mabuchi recalled the name of the uber coil: Genesis. Retrieving Genesis was his original mission’s objective, and he cannot remember what he did with it. I think it’s no exaggeration to say that Mabuchi was displeased with how K.K. treated Ruwai. 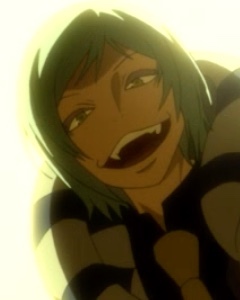 I mean, just look at his canine teeth! Capture from the Funimation stream. Ruwai attacks K.K., but misses. Zombie Yuriy machine guns Ruwai until his artificial body is useless. K.K. threatens to shoot Ruwai through his eye to finish the job, only to have Ruwai cut off his own head. Mabuchi sees this and rips into K.K. with the intent of killing him. Yurizaki intervenes, saying killing is wrong. At that moment, one of Ruwai’s transport robots lands, and he emerges to apologize for not telling Mabuchi that he has more than one body. Finally! Mabuchi thanks Yurizaki and shows her some appreciation! It was short-lived, but there’s actual video proof that it happened! I continue to enjoy Reina Ueda’s voice acting as Yurizaki. Her voice is sweet and innocent, and at the same time it’s not sickly sweet. I think the voice adds a lot of charisma to the character. I have to give Mabuchi points for trying to protect Ruwai. I think he protected the young prince just because he was fond of him. The concept of why human souls depart in the void — that there are no more possibilities — is intriguing. I hope the story builds a little more on that concept. Mabuchi closed Doug’s dead eyes. That struck me as a sign of respect and camaraderie, fitting for the two who had fought alongside each other. Mabuchi’s fighting style looks more and more like Zui quan martial arts, which is where the attacker moves as if he’s drunk. Mabuchi has the relaxed, unpredictable fluidity of motion. The animation, like when Mabuchi fights, continues to be enjoyable to watch. So, Seameyer just shoved folks through the portal, even knowing they’d die? Why? What in the world is his motivation? To me, the character seems more like a caricature, and that’s seriously blunting my acceptance of him as a villain. Such a strange little villain… Capture from the Funimation stream. Apparently, K.K. can interact with the void. Jason knows about the uber coil. Was it only Mabuchi (and us in the audience) who didn’t know all about Adrastea? Maybe I’m missing something, but this all feels both contrived and disjointed. K.K. sure did like to talk. And talk and talk and talk. I could just hear Syndrome from The Incredibles…. How did Yurizaki know that Ruwai wasn’t really dead? I didn’t see any kinds of communication between the two of them. This seemed like a plot inconsistency to me. Or was that bright flashy thing she was when separated from Mabuchi Ruwai’s rocket robot? I’m assuming this story arc will consume a 12 episode season of Dimension W. If that assumption isn’t true, then maybe the opinion I’m about to share is off tainted. The show feels really disjointed to me. I understand revealing details late in the series: like the people who were trapped in the void having no soul. That makes sense to me. But what’s Salba Ene Tibesti doing? Why does he treat Lashiti so badly, and why does she still revere him? What is Seameyer up to and why? If he’s the show’s driving villain, shouldn’t I know more about his motivations by now? What’s up with New Tesla Energy’s hands-off role in containing Seameyer? Did Salba know about Seameyer, and if he did, why didn’t he take more precautions? For me, a lot of this uncertainty comes from what I see as Seameyer’s poor characterization. It undermines my confidence in the narrative. Well, we have 2 episodes to go (I think). Maybe things will start coming together.